What are they singing at the Vatican? Should prayers and hymns be part of the commons? Anthony Symondson on "Hardman of Birmingham"
The celebration "versus Deum" is - together with Communion in the mouth and the Latin language of worship - not the subject of the "reform of the reform" of the liturgy desired by Pope Benedict XVI, but the implementation of the applicable law. At issue here is the correction of a misguided development after the Second Vatican Council. Præstat ut altare maius extruatur a pariete seiunctum, ut facile circumiri et in eo celebratio versus populum peragi possit..."(Sacra Congregatio Rituum  898, Nr. 91). 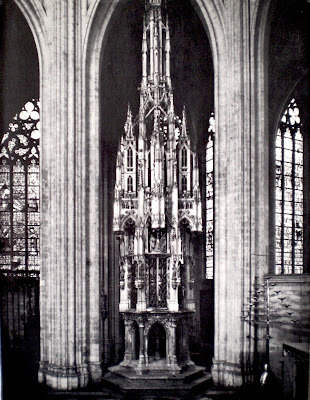 "It is better that the main altar is built detached from the wall, in order that one can easily walk around it and celebration versus populum can take place on it." The main statement of the text is the separation of the altar from the rear wall (a pariete seiunctum). 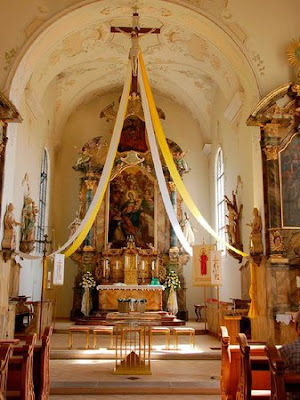 "It is better that the main altar is built detached from the wall, so that one can easily walk around it and celebration versus populum can take place on it." If one therefore takes the ut as consecutive, the walking around and the celebration would be a consequence of the separation of the altar. Through this change in the causal logic of the statements, the reference to the celebration (sc. versus populum) would be further weakened. What matters to the legislator is the possibility of detaching the altar from the rear wall, not the celebration versus populum. The latter remains a minor aside. Whatever the case, the instruction of 1964 speaks only to the possibility of celebration towards the people. It is therefore on no account a prescription. In other words: the celebration versus populum is allowed by Inter Oecumenici, but not prescribed. Thus it is only consistent that the rubrics of the Missale Romanum of Pope Paul VI. ("Novus Ordo") do not assume the celebration versus populum, but the celebration versus orientem (improperly and theologically incorrectly: "celebration with the back to the people") when they say that the priest at the Orate, Fratres, at the Pax Domini, the Ecce Angus Dei and the ritus conclusionis turns to the people. This indication would be superfluous if the rubrics of the Novus Ordo would envisage the celebration versus populum. Thus also the post-conciliar Missal of Paul VI. assumes that the priest celebrates Mass turned towards the altar and not to the people. Before the Communion of the priest it even says explicitly "ad altare versus", turned to the altar. The third Editio typica of the revised Missale Romanum retains these rubrics (Missale Romanum , Ordo Missæ, 515, No. 28, 600, No. 127, 601, No. 132 f., 603, No. 141). Altare extruatur a pariete seiunctum, ut facile cirumiri et in eo celebratio versus populum peragi possit, quod expedit ubicumque possibile est. "The altar shall be built detached from the wall, in order that" or: so that "one can easily walk around it and celebration versus populum can take place on it, which is useful wherever it is possible." 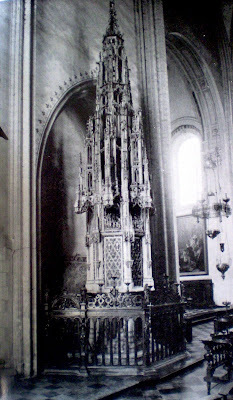 In contrast to the instruction Inter Oecumenici of 1964, the Institutio Generalis of 2000 adds and explains that the construction of the altar detached from the rear wall is useful and beneficial (expedit). The benefit relates to the position of the altar, not to the direction of celebration. 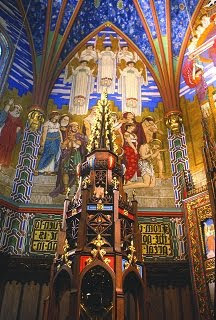 Of this it is merely said that it becomes possible by separating the altar from the rear wall (peragi possit). Here, too, therefore, no requirement of a celebration towards the people is being expressed. But that means: There is no obligation to celebrate versus populum. This also clearly results from a response of the Congregation for Divine Worship and the Discipline of the Sacraments of 25 September 2000: "It is in the first place to be borne in mind that the word expedit does not constitute an obligation, but a suggestion that refers to the construction of the altar a pariete sejunctum [detached from the wall] and to the celebration versus populum [towards the people]." Then, the Congregation further explains: "The clause ubi possibile sit [where it is possible] refers to different elements, as, for example, the topography of the place, the availability of space, the artistic value of the existing altar, the sensibility of the people participating in the celebrations in a particular church, etc." The Institutio Generalis of 2000 therefore regards the celebration versus populum as a possibility, without excluding the celebration versus orientem resp. towards the altar. Legally, therefore, the celebration versus orientem is the normal form of celebration. 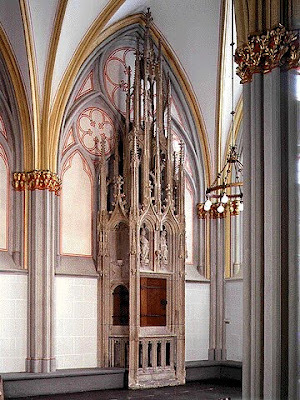 For reasons of space or architectural reasons, it is possible to place the altar separately from the back wall, which makes possible a celebration toward the people, but it must be stressed that on such an altar the celebration versus populum is not mandatory, but is provided for as a possibility. A couple of weeks ago, the NLM mentioned a workshop that had been organized within the diocese of Birmingham, Alabama, which saw the participation of Fr. Justin Nolan, FSSP, Fr. Joseph Mary Wolfe, MFVA and Fr. Dominic Mary Garner, MFVA (two Franciscan friars from EWTN). The presentations and homilies given as part of this workshop are now available online. As well, videos from the Solemn Mass has now also been made available. I wanted to put in a kind word for the wondrous Loome Theological Booksellers in the remarkable little riverside town of Stillwater, Minnesota, otherwise known to me as the Happiest Place on Earth The nineteenth-century town of Stillwater clings to the steep bluffs along a wide stretch of the St. Croix River, the border between Minnesota and Wisconsin. It is known as one of the world's premier "booktowns," and the first officially established outside of Europe. The "booktown" concept was dreamed up many years ago by an eccentric Welshman, "King" Richard Booth, whose hometown, Hay-on-Wye in Wales, became the first--its entire economy effectively revolves around bookselling. Hay-on-Wye has over 20 bookstores with reportedly 2 million books for sale, and only 1,300 inhabitants. Booth helped establish other booktowns across Europe. Stillwater is a bit larger, but with 35 bookstores of its own, it certainly qualified, and officially received its status by a proclamation of Hay-on-Wye's self-proclaimed king in 1994. There are now booktowns all over the world, including Malaysia and Japan, and at least two others in the United States. One of the crown jewels of this remarkable little place is, as I have said, Loome Theological Booksellers, the world's largest second-hand dealer of religious books, and undoubtedly at least in the top ten of the world's largest used and antiquarian book dealers. It sits halfway up the slope, overlooking the river. As someone who spent a good deal of his free time haunting the eclectic but oddly-organized architecture section at the Strand in New York, I can say that Loome's is a very special place. It's the sort of setting you'd expect to find a trap-door or revolving panel that leads into the secret branch headquarters of an underground group of Templars, or perhaps a cover for a safehouse for Vatican demon-hunters. I'd only spent about an hour there (and about $125) before a few weeks ago, when I dropped into town for an overnight visit. A friend who first I'd met years ago in Rome is now half-owner of the place, after Dr. Loome's retirement. For someone like me, this is like discovering a pal from high school been elected President. Or at least Grand-Master of the Knights of Malta. What is especially pleasing about Loome's is it is not a chain. The place has a personality all its own. But it also has an unparalleled selection, and is quite well-organized and well-staffed, unlike some more idiosyncratic mom-and-pop establishments. Mr. P-- is a member of the rising generation of young, tradition-minded Catholics now starting to make their mark on the world and has a lovely wife and, as I said just now, three kids--two rambunctious boys and a tall, solemn, quiet young girl--and is by no means a mogul. He runs his business sensibly and intelligently, but he also loves his work, and the Faith, and is active in his home parish, the lively St. Charles, down the river, which has an extremely active and friendly little congregation and a great liturgical program for its size. In an age where the choice is often between smooth, institutional mediocrity and awkward, home-grown mediocrity, Loome's is a treasure and a rarity, an example of a well-run family business with a real family behind it. You will find everything from honest-to-goodness illuminated manuscripts from the depths of the Middle Ages to 1950s church-design manuals. There is plenty to interest not only the Catholic, but the Lutheran, Anglican, Presbyterian or Orthodox Christian, provided he is an antiquarian and bibliomane like me. Stop in the next time you're in the area--it's well worth at least a detour, or possibly even a whole trip. Make sure there's space in the trunk for your purchases. You'll need it. The first extraordinary form in a Montgomery, Alabama, parish in forty years will take place September 27, 2009, at 5pm, St. Peter's Catholic Church. It will be a Missa Cantata, featuring all Gregorian propers plus W. Byrd's Mass for Three Voices, a sung by members of the St. Cecilia Schola in Auburn. The Mass will be celebrated by Fr. 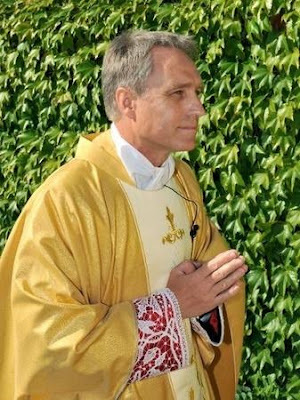 Mark Fischer of the St. Francis De Sales Catholic Church in Atlanta, Georgia. It would be fantastic to see the Church with standing room only, along with a generous collection for the visiting priest and the parish, and I see no reason why this shouldn't happen. The pent-up demand for the extraordinary form in this town has a long history--it's been a long wandering the desert--and here it is being welcomed with open arms in this gorgeous parish and with the full support of the Archbishop of Mobile. The effort do bring this about was led by Una Voce Central Alabama. I'll be in the loft, not the pew, but I'm personally very excited about this particular event. I had sung for the dedication of St. Francis when Fr. Fischer was pastor the first time around, so this is like history coming full circle for me. Also, the pleasure of singing or hearing Byrd's Mass is intensified by the history of this particular setting of the Ordinary. It was composed for secret Masses during Byrd's service as composer for Queen Elizabeth, as part of the interesting double life that Byrd lived. The virtual suppression of the preconciliar Mass in the years following Vatican II seemed to share some similar qualities that are in retrospect gravely regrettable. But now what was only in secret is now in public. There is a third point but I only have sketchy details and some might be wrong, so I welcome a correction from anyone who can provide one. I can recall 15 years ago hearing of a Tridentine Mass in Montgomery and driving to find its location. I became lost several times (pre-GPS) and finally came to a small structure in what seemed to be a nowhere residential area. It certainly wasn't a Church. I had gathered that I had happened upon an independent chapel of some sort so I lost my nerve and didn't attend. It was unclear to me whether I was even in the right place. Still, I've remained curious about that all these years. Meanwhile, only recently, I heard a story about the pastor of St. Peter's in the late 1960s who was older and very much attached to the preconciliar form and quite simply refused to say the new form of Mass even after it was mandated and the older form suppressed. This is where details are foggy and perhaps someone knows the full story. I've heard it said that he was removed from the parish but retained faculties and that he continued to say private Masses for many years, inviting others as they saw fit. He said Mass in homes mostly but also in other places where there was a need. In other words, it is quite possible that the Mass I had nearly attended in Montgomery some 15 years ago was being said by this former pastor of St. Peter's which is now opening the parish to that very form of Mass and happily hosting its revival. I don't know if that is true, and I don't have enough contacts with a community that might have attended back then to know for sure. Nor do I recall the priest's name, though I've heard his name used. Again, perhaps someone can help with the details. That confluence of events should teach us all something about time and principles and the tendency of history to eventually right itself. One wonders how common such incidents were in the "old days"; one wonders sometimes just how brutal it was for pastors in those years of crossing from old to new. All of that aside, this really isn't a post about picking at old wounds. The fact is that this is going to be an amazing time of celebration for everyone. Leading up to the event, I think we can fully expect promotional coverage in the archdiocesan paper and elsewhere. It is a glorious thing even in an empty parish; if it were to be packed with praying and singing people, that would be sweeter still. One final point needs to be made. The music we will be singing is as normative for the ordinary form as it is for the extrordinary form. Both forms call for Gregorian propers. Both forms can accommodate a polyphonic ordinary. And yet this is the first time that members of our schola will have sung both in the same Mass and it so happens to be a preconciliar Mass. There really is no reason to wait for the extraordinary form to come to town to have beautiful music. No reason to wait at all. 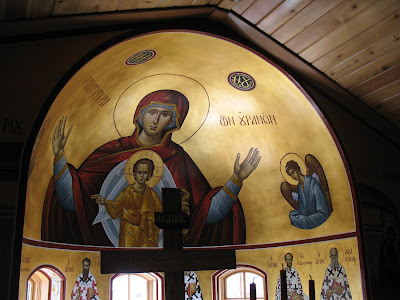 I was taken by the desire to share some further brief thoughts from the Christian East, picking up from our consideration of last week on the holy Icon and the depth of theological meaning to be found there in its various regards. I turned to a set of books published as part of the Cistercian Studies series, The Spirituality of the Christian East by Tomas Spidlik, SJ. I began with a consideration of various paragraphs and sections, but I determined to simply instead present a few very brief quotations from those books, that might serve as a point of some brief reflection and consideration. "The icon is one of the manifestations of the holy Tradition of the Church, just the same as the written and oral tradition.' 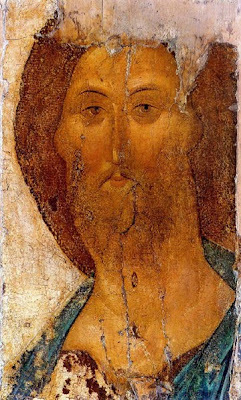 Following Basil, the Seventh Ecumenical Council (787) compared painting to the proclamation of the faith..."
"It is not a mere painting... one venerates and contemplates icons. The aim of the art of iconography is to give witness to the presence of God in his visible image... the composition and the perspective, the colors and the light, the decorative elements: everything takes on a spiritual meaning..."
"The church [building] is 'heaven on earth', where the presence of God becomes somehow visible in the beauty of the rituals and the symbolism of the building." "...the Fathers defended the richness of [liturgical] worship. The beauty of the house of God should give the faithful a foretaste of the beauty of heaven. The 'sweetness of the church' should be transparent in the liturgical functions to create an impression of 'heaven on earth'..."
[Expanding on beauty in its various forms] "...Basil had already adopted the stoic view of the beautiful as a harmony that appeases the soul. Along these same lines, Pavel Florensky identified beauty with the unity of the Holy Trinity and its reprecussions in the christian life. Beauty, then, is the natural ambience of someone who, while praying, understands the full spiritual wealth of the Church. Various elements should contribute to the splendor of the liturgy: the building, icons, vestments, candles, incense, bells and chanting." From time to time, I've seen author signings at bookstores where the author is sitting all by himself with a stack of books, as shoppers walk right by him as if he is doesn't exist. It always makes me sad. You know what I mean. Well, I hope that does happen to me on September 24, 2009, when I'll be at the Catholic Information Center in Washington, D.C., 6-7:30pm. The schedule has me giving a talk and then signing copies of Sing Like a Catholic. My general theme is by now probably well-known to readers of this site: the desperate need for a unifying and universal music voice in liturgy for all Catholics to call their own. With plenty of time for discussion, it could be fun, and of course I'm enormously honored by the invitation. When the book first appeared, I received emails from a few old hands who said: I can't believe that you actually put out a book stating the incredible obvious! But here is the thing that people in the know seem to forget: the current generation of Catholic musicians is in serious need of education on the basics of Catholic music. Progress has been seriously interrupted in the last several decades and now that matters are getting on the right track again, we need to re-learn what was once known all over again. If my book has value at all, it is not because it says anything new or that it says anything for the first time; it is that it says old things within the current context of our transitional moment in Catholic music. Judging from the outstanding response to the Chant Pilgrimage that starts the following day, the Washington, D.C., area seems to be a hotbed of progress in the area of liturgical music. So sitting alone at a table perhaps won't be my fate after all! Fr. 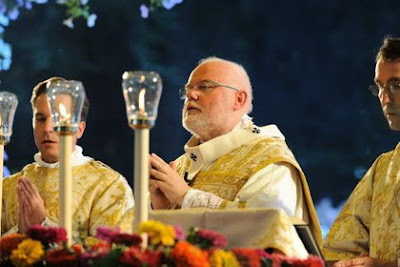 Finigan over at the Hermeneutic of Continuity has done a translation of a response by respected Italian journalist and Vaticanist, Andrea Tornielli, where he comments on the recent statements made by Cardinal Bertone and by Fr. Benedettini. He also comments on the reporting of some press agencies, citing Zenit specifically, with regard to his own story. My dear friends, I return to the subject matter of the post which, on 22 August last, I devoted to the questions discussed by the plenary session of the Congregation for Divine Worship regarding the recovery of a greater sense of sacrality in the liturgy. As you know, and as has already been noted, in the afternoon of Monday 24 August, the vice-director of the Press Office of the Holy See, Fr Ciro Benedittini (whom I greatly esteem) put out by means of Vatican Radio a verbal declaration regarding the subject of my article. These are his carefully measured and considered words: “At the moment, there do not exist institutional proposals regarding a modification of the liturgical books currently in use”. This supposed denial has made the rounds of the blogs: more than a few have not hidden a tinge of satisfaction for the fact that the undersigned has been caught in the act. Further, in the interview given yesterday to L’Osservatore Romano, the Cardinal Secretary of State, Tarcisio Bertone made a reference to the fanciful reconstructions of documents of “going back” with respect to the Council, words which the agency Zenit presented as linked to my article. 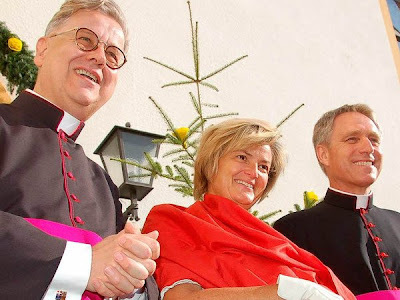 I would like to tell you that the denial of Fr Benedittini was provoked not so much by my article, as by its being taken up by many blogs (after the Williamson case, blogs and websites are now constantly monitored by the Holy See) which presented as imminent the “reform of the reform” and modifications of the Mass in a more traditional direction (or of “going back” according to the expression used by Cardinal Bertone). First of all, in my article, I never spoke of imminent reforms or of documents already prepared, and at the conclusion I said clearly that it was a matter of the beginning of a work. A long work which does not want to send things down from above by imposition, but to involve the episcopates. I spoke of the voting that had taken place at the plenary session of the Congregation, of the fact that Cardinal Canizares had taken the results to the Pope, of the fact that study had begun, not on “institutional proposals regarding a modification of the liturgical books currently in use” but rather on more precise and rigorous indications regarding the manner of celebration with the existing books and in some cases those just published. All of this is to tell you not to believe those who today write that nothing is happening, that the Pope and the Congregation for Worship are not thinking of anything, that the “reform of the reform” and its recovery of a greater sacrality of the liturgy is a piece of news falsely published by the undersigned. Since I have been a vaticanista, I have committed many errors – and I will commit many in the future: but the article in question, believe me, is not among these. Moreover, the fact that “at the moment” there are not “institutional proposals” for reform, does not deny that already today there are proposals for study that have not yet become “institutional”. It is enough to read what Cardinal Ratzinger has written in his time, and what Pope Benedict XVI has written in his letter accompanying the motu proprio Summorum Pontificum, to be aware how much this theme is close to his heart. Tornielli speaks to what many of us also have in our own commentaries, which is that the "denials" do not actually deny anything that Tornielli himself reported. 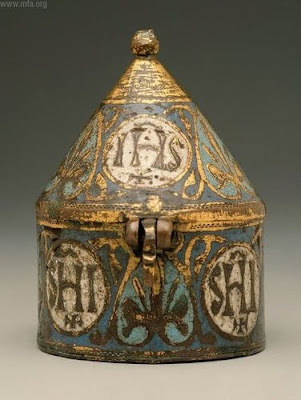 Source: The Hermeneutic of Continuity: Andrea Tornielli "le smentite che non smentiscono"
Recently, we looked at the hanging pyx as one of the historical methods of reservation of the Blessed Sacrament. Since we mentioned that, I determined we should also document another method of reservation, that of the "Sacrament House". From my research, these seem to be particularly in evidence within Northern Europe where they are called "Sacramentstoren" or "Sakramentshäus". 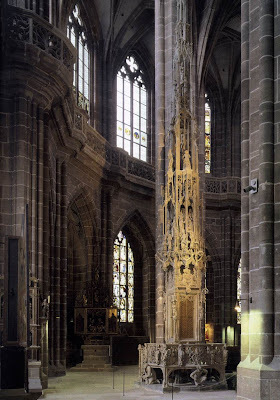 The elaborate stone structure in which the Eucharist is reserved in many of the churches of Germany and the Low Countries, isolated from the altar and normally on the gospel side of the sanctuary, is known as a sacrament house. 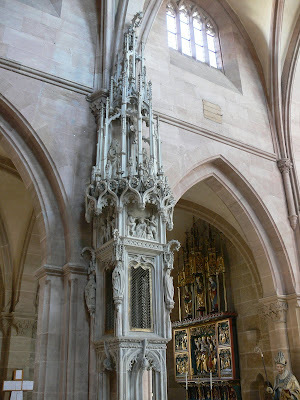 They were often sculptured in the form of a monumental tower, approached by several steps, and with a railing around, on which candles were placed. Sometimes, also, there were two or more storeys and a space above for a light. These sacrament houses appeared first in Germany in the fourteenth century (c. 1380), and became increasingly popular both there and in the Low Countries in the two subsequent centuries. Sacrament houses are found also in France, although they are comparatively rare. Here are some images of Sacrament Houses. St. Jacques, Louvain, Belgium. 1539. Note the prickets on the railings for candles. 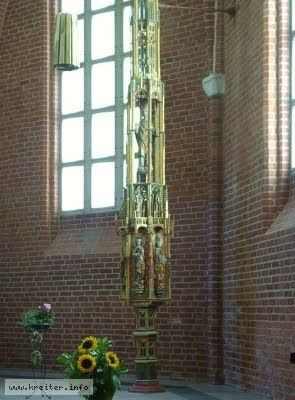 St. Martinuskerkaalst. This one has more of a classical style and reredos appearance to it. Here, as well, are some modern day examples. It was only this evening that I learnt that Archbishop Terrence Prendergast, the Archbishop of Ottawa, has, since April of 2009, his own blog: The Journey of a Bishop. The Archbishop is a member of the Vox Clara committee and on his blog today, he reported on the 17th session of that committee, which has been meeting at the Pontifical North American College in Rome this past August 25th-27th. The Committee began by exploring means by which it might provide effective support to the Congregation as it seeks to achieve an expeditious confirmation of the Roman Missal. Certain technical and editorial processes were developed by which amendments submitted by the Conferences of Bishops, the counsel of the Vox Clara Committee and the internal deliberations of the Congregation might be effectively utilized by the Congregation in its final editing of the final text of the Roman Missal. The greater part of the time was spent in a final review of four White Book translations of Missale Romanum, editio typica tertia, as produced by the International Commission on English in the Liturgy and recently approved by several Conferences of Bishops. Following their discussion of the ICEL renderings of Masses for Various Needs and Intentions, Ritual Masses, Votive Masses, Masses for the Dead, and the Order of Mass II, the Committee submitted its recommendations to the Congregation concerning the definitive confirmation of these texts. Archbishop J. Augustine Di Noia O.P., recently appointed Secretary of the Congregation for Divine Worship and the Discipline of the Sacraments, was welcomed and briefed by the Committee on the last day of its work. Archbishop Di Noia thanked the Committee for its working in applying “the critical distinction between translating a text and translating a sacred text in the vernacular.” He also expressed his thanks for the proposal for additional assistance to the Congregation, noting, in particular, the need for assuring the technical quality and internal consistency of the new Missal. The Archbishop's report includes a number of photos from the session. Visit his site to view those and the full text of his report. A reader sends in news that Juan Luis Cardinal Cipriani, Archbishop of Lima, Perú, recently gave a homily at this Cathedral church where he has publicly recommended certain traditional practices in regard to the distribution and reception of Holy Communion. In that piece the Cardinal Archbishop calls for the use of the communion paten in the distribution of Holy Communion and further promotes the manner of receiving the Holy Eucharist on the tongue. 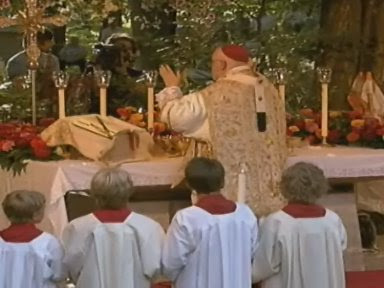 The Cardinal also makes note of the importance of receiving the Eucharist only in a state of grace. He also notes the importance of showing a visible sign of reverence prior to receiving the Eucharist, giving particular recommendation to the practice of kneeling. Clearly these initiatives mesh with the Holy Father's own example of the distribution of Holy Communion at papal Masses. People often ask what is the best Catholic hymnal in print with English hymns. Without meaning to slight other products out there, my answer is one from 1981, a book I had never heard of until about two weeks ago. In fact, I seriously doubt that many people know about it. I'm not sure I understand its origin or purpose or why it is not more famous. In its current state, it is not usable for parishes and it is not clear that it was ever intended to be. You can buy it but you have to look hard to find it, even though it is in print. The cover is nothing special and it has a strange name. Lots of work went into it but it is not marketed to any great extent, if at all. "250 Hymns in the Public Domain. 106 settings of music for the Rites of the Church." The contents are fantastic in every way. The text is in tact. The melodies are great, the best that hymnody has to offer. As suggested in the description, all 250 English-language hymns are in the public domain. That took some research to discover. Public domain means that the text and melodies are part of the commons of the faith. There is no restriction at all on performing them or marketing them or printing them or arranging them. And look at the time in which the book came out: 1981. That was right in the thick of one of the biggest crisis in the history of Church music. In the Catholic Church, this hymnal might have sparred us much pain and suffering. At a time when nearly everything coming out of the publishing houses was, well, I won't characterize it. Let's just leave it that this collection, widely distributed, would have put matters on sound track. The public domain aspect of it would have saved millions in royalty payments. What a gift to the faith! But wait: there is more to the strangeness of this product. The front matter says that the hymns are public domain, but still restricts their printing. How so? Well, it is an interesting thing. The texts are part of the common. The hymn tunes are part of the commons. But ICEL came up with an interesting little proviso: they claimed copyright to the typography! That means that you couldn't so much as slap a page on a copy machine without breaking the law - even though the content is public domain. I don't understand why ICEL/GIA would have done this, or maybe I do. One can't be sure. In any case, the proviso left this book to suffer alone and unused. One wonders why they bothered to put it out at all. I'm imagining a conjectural history in which someone at ICEL had the very good impulse of saving parishes money and getting great hymns out to the public. Then at the last minute, some powerful person swung in to defeat the whole purpose of the thing by adding one sentence to the front matter. Given the prevailing business model of copyright/royalties, and the war chests that publishers pride themselves in accumulating in the dog-eat-dog world of publish-to-parish marketing, one can see why this product had no place: no one benefits from it except Catholic people and the Catholic liturgy generally. The CMAA working on a work around right now. The California Catholic Daily has a great idea: short profiles of parishes that use Gregorian chant. You can see here how the tradition is handed from teacher to student, who then becomes a teacher to more teachers and so on. The tradition is really coming back to life in a beautiful way. I have been offering Mass in the usus antiquior only since last September. 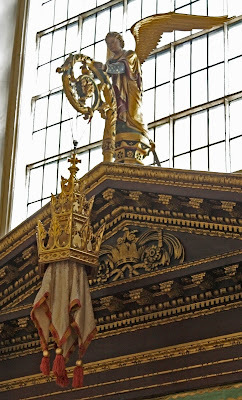 My question is: how is one to construct a catafalque for the Absolution after Mass on All Souls? It is a good question that others may likewise wonder about, and it is nice to see this matter being prepared for. With All Souls Day only 9 weeks away, it is certainly not too soon. Before discussing the catafalque itself, a few other notes are in order. The first point is that one typically sees six candles (though this number does not seem to be formally so defined by the rubrics) and candlesticks used; three on each side of the catafalque, set on the ground. One will also need a black pall. A wooden or steel structure, sometimes surmounted by a casket covered by a pall which represents the coffin with the body of the deceased when it is not present. In the photographs above, one sees both described arrangements. 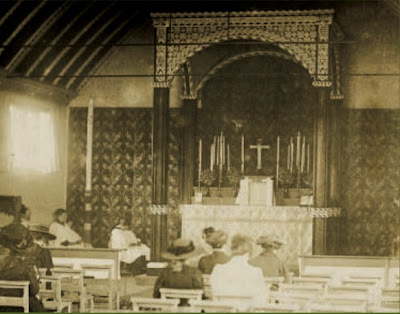 So far as I can see then, the catafalque is simply constructed of a bier (a raised rectangular wooden box or metal stand of dimensions that would hold an adult sized coffin) which is then covered by the black pall, or the same, further with a type of symbolic coffin further placed upon it, similarly covered. Perhaps some of our readers would share what their parishes do in this regard. If anyone has anything to add, please do jump in in the comments. 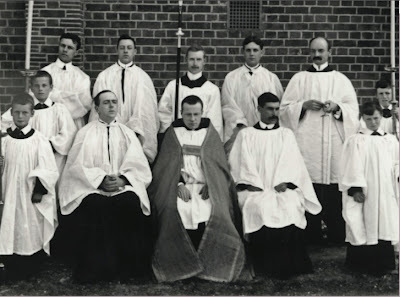 To read more on these rites and ceremonies in the context of the usus antiquior, see the Ceremonies of the Roman Rite Described (Fortescue, O'Connell, Reid) and The Celebration of Mass (J.B. O'Connell). 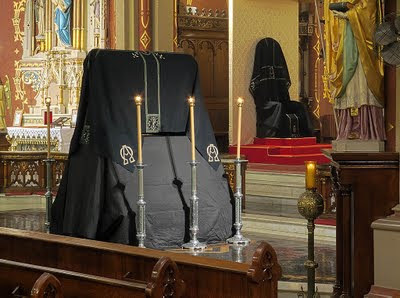 I would also take this moment to give recommendation to priests using black vestments and unbleached beeswax candles for All Souls Day Masses in the context of the modern Roman liturgy. Now is a good time to source out these things. Mr Tornielli stood by his story, saying that he interpreted Fr Benedettini's denial of "institutional proposals" as indicative of "unofficial (for now) projects". The NLM has mentioned the Dominican Sisters of Mary, Mother of the Eucharist a few times before and today Catholic News Agency has the following story on them: Ann Arbor sisters can't build fast enough to house new members. Now, to the Psalter project. Here is a post about it and another. Here they explain that their choice of translation was driven by the desire to open source the entire project rather than use copyright protected material. In general, their goal is to update the Cistercian books according to current guidelines, the first such effort since 1948. Here is Sunday Vespers. Here is Compline and The Office of the Dead. You can see a complete page of their work so far. It nearly slipped my mind, but earlier this month, August 1st to be precise, the NLM celebrated its foundation date, the completion of 4 years of operation, and the beginning of its 5th year. At some point you might hear reference to the "hanging pyx." 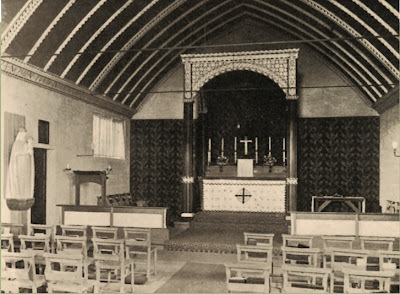 For the most part today, you would seldom see it -- though we have shown one here awhile back within the context of a Milanese chapel, and if you study gothic revival architecture, you will occasionally find them within certain English churches. 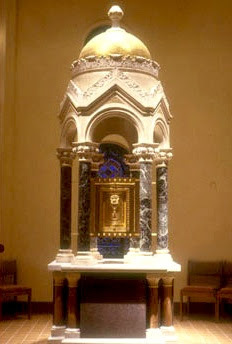 The hanging pyx is a suspended form of tabernacle, or place of reservation in other words, for the Blessed Sacrament. 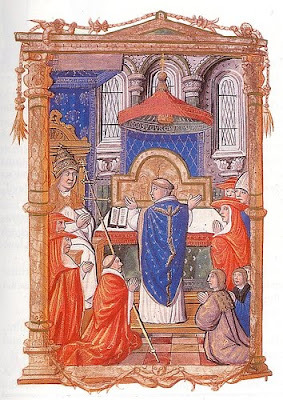 Archdale King in, Eucharistic Reservation in the Western Church suggests that it was a "very general" (though not universal) form of Eucharistic reservation through England, Scotland and France during the middle ages -- and in France, later still according to Peter F. Anson. The usual method for fixing the pyx was for a crane or pulley to be so arranged over the altar as to permit of the ready raising or lowering of the pyx, which was suspended by a cord or chain attached to a ring on its top. 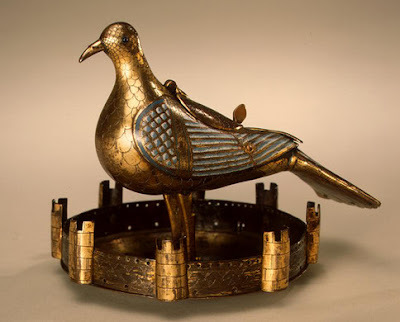 Above the pyx was hung the canopy, a circular tent-like construction formed of some costly fabric, which was generally attached to a ring and ornamental crown of metal. The pyx itself was veiled in a pyx cloth, which often had the form of a square napkin, with a hole in the middle, through which the suspending cord passed, and weighted tassles at the four corners which kept it down close by the pyx. 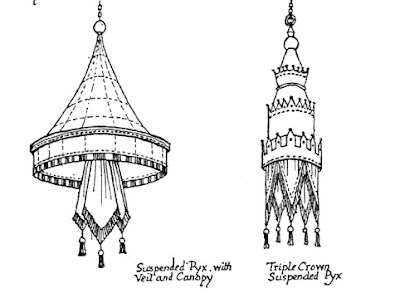 Peter F. Anson's book, Churches: Their Plan and Furnishing shows a number of examples of some different forms of hanging pyxes. A gothic revival triple crown pyx, found in Grosvenor Chapel in Mayfair, London, by Sir Ninian Comper. 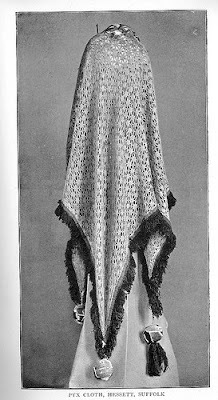 (Image by Lawrence Lew, OP) You can see the tassled pyx cloth. Those of you interested in this subject may wish to read Dr. Allan Barton's own article on this subject from one year ago, which I discovered while sourcing out some of the images for this. When I recently discovered that the First Garden City Heritage Museum in Letchworth had done an exhibition on Fr. Adrian Fortescue and the parish of St. Hugh of Lincoln in Letchworth, I immediately contacted them. The museum staff were kind enough to send me a number of photos from the exhibition, which include historical photos of the original parish of St. Hugh itself (which is no longer standing, at least in the form Fortescue knew it in), of Adrian Fortescue himself, and also of Fortescue's marvelous script work -- not to mention a few other odds and ends. 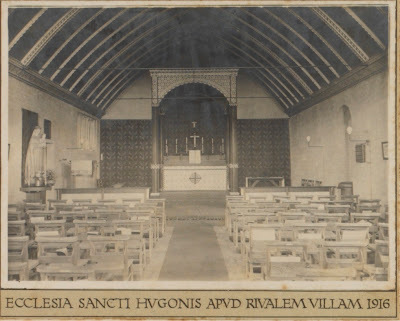 Today, I thought I would show you a few of these photos, focusing on the interior of the parish of St. Hugh itself as well as one other photo. These might lend at least some sense of liturgical life under Fortescue's influence. Click to enlarge and see the beautiful detailing of the ciborium magnum, as well as the patterns behind the candlesticks. Atop the ciborium is written "Beati qui ad coenam nuptiarum Agni vocati sunt" taken from the Book of Revelation, chapter 19, verse 9: "Blessed are they that are called to the marriage supper of the Lamb"
Rest assured, there will be more forthcoming in relation to this, but I could not resist showing these photos quickly. 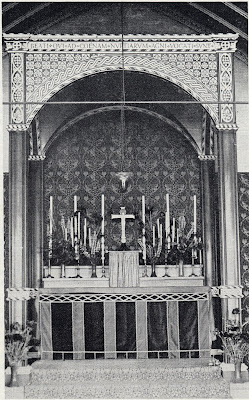 I was overjoyed when I was approached to do a long article on Oakland Cathedral for Sacred Architecture, moving from the book review section to their main features, especially as I fondly remember my days working on the magazine during my time in Mr. Stroik's office as an undergrad. It was a difficult and challenging article to write, as I sought to face the question without the usual sarcasm and frustration that a confirmed architectural traditionalist such as myself is frequently tempted to bring to such a piece. And I think the result is a fair, balanced article that nonetheless does not overlook some substantial aesthetic and practical problems with the design. It is called "The Lonely God" and can be easily found in the middle of the 2009 edition of the journal. It marks, also, probably the first time the word "JumboTron" has been used in a work of ecclesiological criticism. 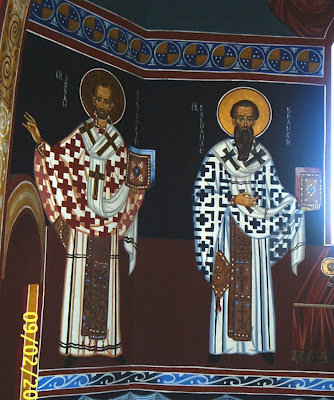 In the course of preparing it, I spoke with both the now-Archbishop Vigneron and the architect himself, and found them both men of goodwill, even if perhaps I might disagree with their aesthetic choices. I certainly appreciate the archbishop's efforts to spruce up the design, even if I wish he had been able to do much more, and am saddened by the ultimate result of the project. The article is not yet available online, but please, have a read the next time you pick up Sacred Architecture. (see picture galleries of the occasion here and here). the Cardinal Archbishop of Madrid as well as Mgr. Wilhelm Imkamp, Consultor to the Congregation for Divine Worship and rector of the pilgrimage church of Maria Vesperbild which has been repeatedly mentioned on the NLM (see e.g. 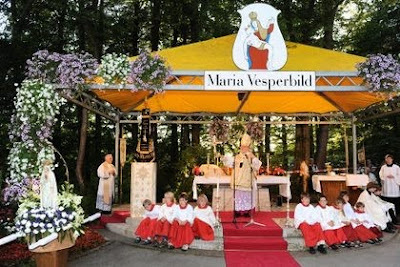 last year's post about the Assumption in Maria Vesperbild with Archbishop Ranjith). Mgr. Imkamp preached at Mgr. 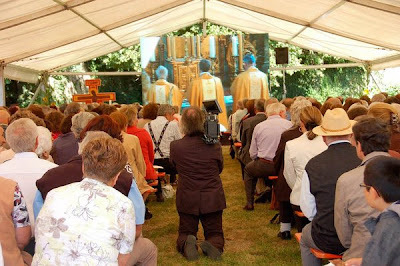 Gänswein's ordination 25 years ago. There also is full video available from katholisch.tv. Images of Mgr. Gänswein's jubilee by Südkurier/Badische Zeitung. I often receive correspondence from folks dealing with parish politics and music, wondering if I and others can help. Of course every situation is different and navigating these areas can be extremely tricky. The question in this case involves the propers. The pastor objects to replacing hymns with propers on grounds that people won't be able to sing the propers and they will feel left out somehow. Of course the people don't deliver the homily either (at least not usually) and no one really objects to this. The fact is that there are specific roles assigned to the choir. Deny them that role and you give them no reason to exist - and this alone takes us a long away toward understanding why choirs have been so gutted from parish life today. So it is not necessarily and either/or situation. It is true the normative form reserves the Introit antiphon for the choir alone. This is a truth that should not be forgotten no matter what else happens. However, The Anglican Use Gradual, however, can be sung by everyone. The Fr. Kelly settings are easily sung by everyone too: 1st time by choir alone, the Psalm, then 2nd time with everyone. I did this just this past Sunday as the sole cantor and it worked very well. Even singing a more complex antiphon, people can join on the Gloria Patri, which I think is what Sing and MS mean by "simple responses." Again, it is not necessarily an either or situation. All that said, there is nothing in Sing that depreciates propers relative to hymns. This is the great merit of this document, especially as compared with the previous document, Music in Catholic Worship, which has been completely displaced and left as a relic of a regrettable era in which all order and sobriety in Catholic music was abandoned. On the other hand, every musician must think in terms of existing opportunities. It is not necessary that all hymns be immediately replaced. One can sing the communion proper and the offertory proper, and leave a hymn at the entrance and recessional, or leave hymns to follow propers. Then the entrance antiphon can be gradually introduced. Most any celebrant can appreciate the point of having people watch the procession and sing music that requires no hymnals rather than burying their heads in a missalette. Recently it was noted that respected Vatican watcher Andrea Tornielli reported about certain reform of the reform initiatives purportedly being put forward. Catholic News Agency reports that the Vatican denies liturgical reforms being formalized. In that report, it is said that on Vatican Radio "[t]he Assistant Director of the Press Office, Father Ciro Benedettini, said that 'so far there are no institutional proposals for amendment of the books currently in use.'" 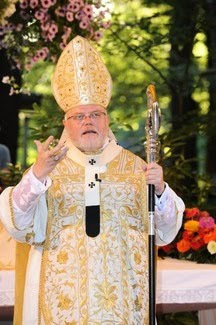 Zenit reports the same story, attributing a similar statement to Benedettini: "for the time being there are no institutional proposals for a modification of the liturgical books used at present." If we are receiving the full picture by way of this brief quote, it may be pertinent that Fr. Benedettini appears to be confining himself to speaking specifically of the amendment or modification of the liturgical books. Tornielli for his own part, however suggested that it was believed by the Pope that "to simply drop directives from above, [will] serve no good.... 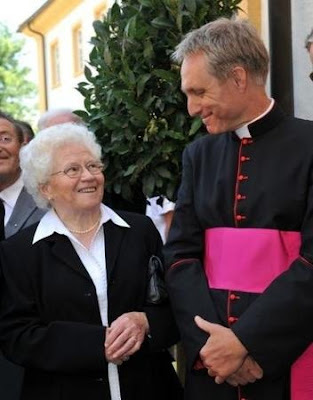 The style of Ratzinger is that of comparison and, above all, of example." In this regard then, it would certainly seem that he has not suggested that modifications/amendments to the liturgical books are underway; of the purported propositions, most do not strictly pertain to the modification or amendment of the liturgical books, speaking instead of recovery, re-affirmation and study. It may or may not also be pertinent that Benedettini's statement is rather qualified, speaking of "institutional proposals." Given the possibility of some topical variances here therefore, the question that might arise is whether this is, as is being reported in the aforementioned news sources, an intended denial of the contents of Tornielli's report, or whether it is not a denial, but rather a pre-emptive assurance, on the heels of Tornielli's story, that there are no formal changes to the liturgical books presently planned. As is always the case with rumours, we shall simply have to wait and see. 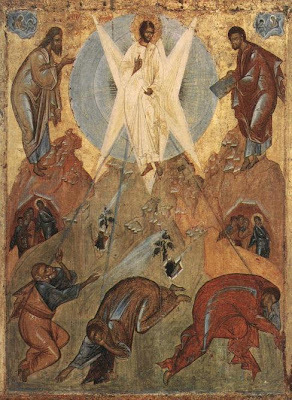 Some of our recent features related to the work and writing of David Clayton, which is inclusive of the iconographic tradition, as well as a recent mention of Russian iconography by Fr. 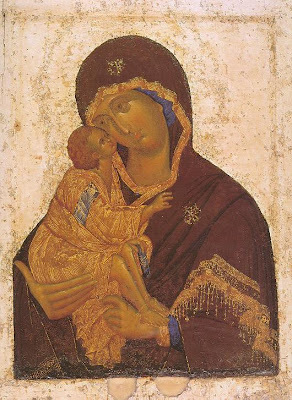 Raymond Blake put me to mind of my own long-standing interest in iconography, particularly from the Byzantine tradition. 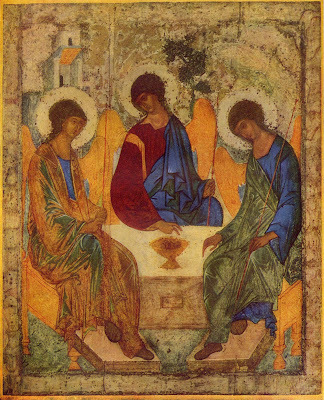 Two particularly important iconographic masters who I have always found of great interest were Andrei Rublev and Theophanes the Greek. Here is some of their work. 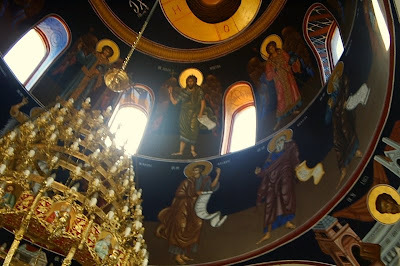 Of course, in studying the theology of the icon and considering the Eastern iconographic tradition, while there is great interest in looking at particular icons in their various symbolic and theological details (and I would highlight the festal icons here in particular), one must also consider them within their ecclesial and liturgical context in order to gain the fullest possible appreciation and understanding of this tradition. 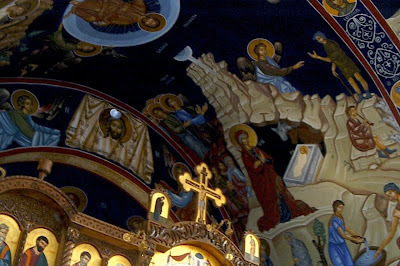 Those familiar with this tradition will know that, while there is some variance in this regard, the placement of the particular icons of a Byzantine church have a rich theological symbolism. 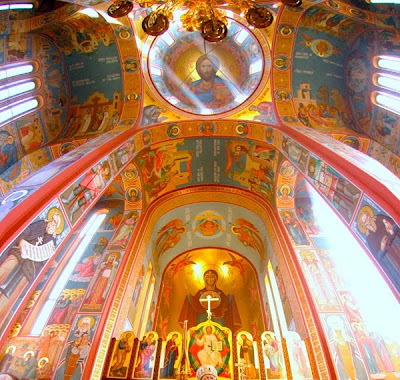 Icons, in short, are not merely decorative in the Eastern tradition. At some point, it would certainly be an idea to speak on each of these matters more in depth. 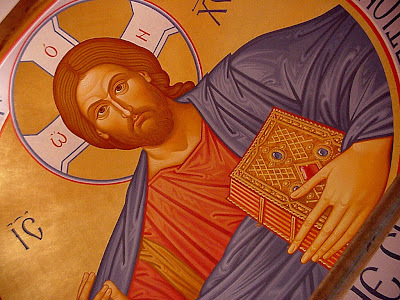 For the moment, however, I simply wished to offer this very most cursory set of thoughts on the rich iconographic tradition of the Christian East.